And so the day we’d all been waiting for finally arrived, the season opener of the Ridley Scottish Cyclocross Series. The great and the good of the many different disciplines within the Scottish cycling scene all merged into one at Auchentoshan to create racing that was exciting, fraught with tension and dynamic. Some had come straight from a long season working hard on the road, some tackling the cross country mountain bike series, and some 'cross specialists who had been waiting for nine months to step back astride a 'cross bike. The delights of cyclocross racing, with its open and varied nature, creates a race atmosphere which is friendly and welcoming to newcomers with racing which is unpredictable and changeable but invariably fast. “It was a fantastic race! Auchentoshan is definitely one of my favourites, it’s the third time I’ve raced here now, which is quite a lot given that I’m reasonably new to the ‘cross scene. I’m a mountain biker, and I’m proud still to sport my hairy legs! 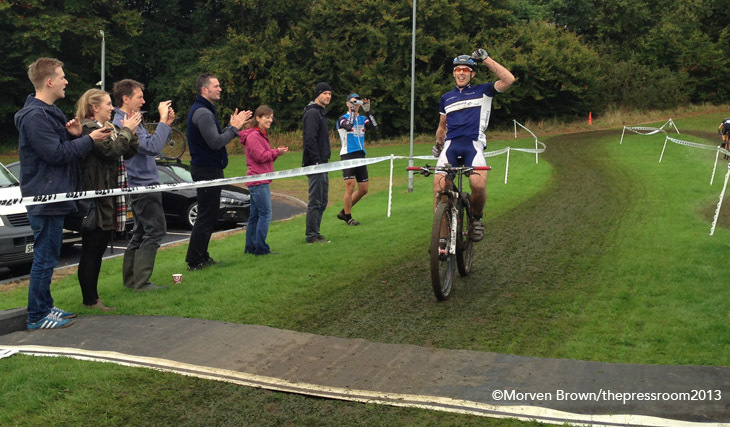 It’s a great course and I’m really excited to start the cyclocross season with a victory. As has come to be expected of the Auchentoshan course, it was fast, flowing and is a firm favourite among the competitors. Following grassy, off-camber corners, designed to test the steering and bike handling skills of even the strongest riders, the course drops into the woods. 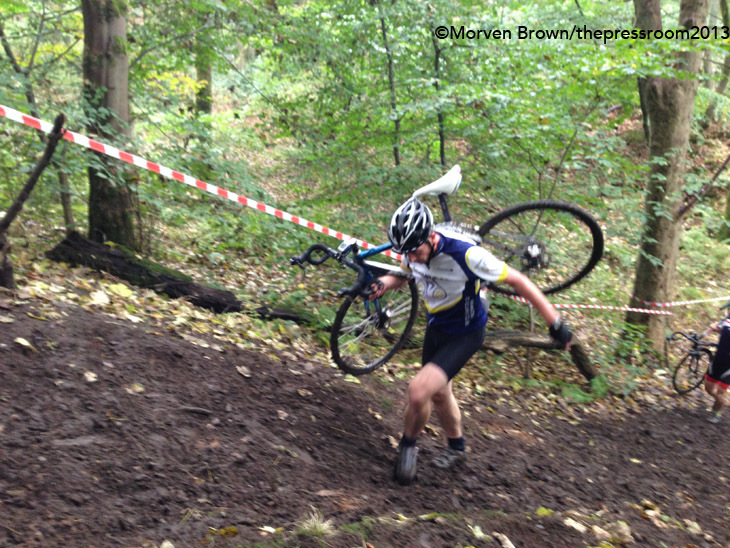 A couple of large, muddy bomb holes and a short, sharp climb later, it’s onto the main feature of the course. A steep descent, with cross-roots and plenty of mud, leads down into the burn – with some riders entering the muddy river head first – before the inevitable cyclocross run up the steep muddy banking! That gravity-defeating bank has been cursed on more than one occasion and referred to by names unsuitable for a pre-watershed report! A few more swoops, turns and off-camber corners and it’s back around to the finish line to complete as many laps of the 6-8 minute course as possible. First races of the day were the Bike Love Under 12 and Under 10 competitors, who battled on a miniature version of the full course. They took on 10 minutes of fast and fierce racing, with parents and supporters shouting themselves hoarse to encourage their child to overtake and to have fun. The ever-illustrious Jamie Johnstone of Thomsons Cycles, current Scottish and British cross-country Champion took the honours in the Under 12 Boys category with a strong 13-second margin over Hamish MacLaren and Callum Reid. First Under 12 Girl was Niamh Docherty ahead of Eva Young and Anna Flynn. 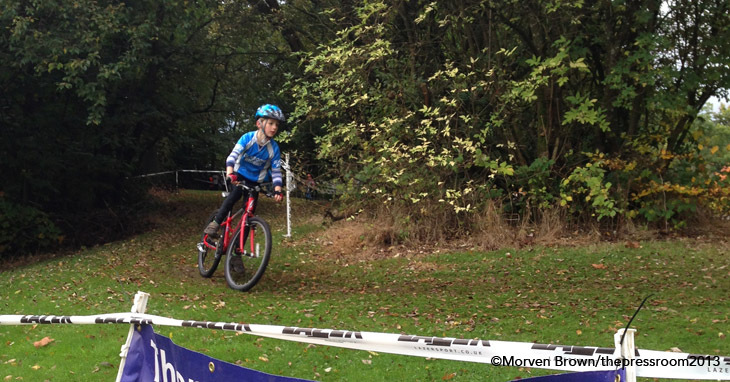 In the Under 10 category, with some riders as young as three years old challenging themselves, Gavin Gronkowski (Mukyriderz) showed strength to take victory ahead of Finn Mason (West Lothian Clarion CC) and Patrick Barnes. Riding for East Kilbride Road Club, Morven Yeoman was closely followed in by Skye Donnelly (Glasgow Riderz) with Kasha Butz in third position. After the race, it was big smiles all around, with these young riders proud of their achievements and already looking forward to the rest of the cyclocross season. The Youth (Under 14 and Under 16 categories) were off next, and were the first race starts to take on the full Auchentoshan loop. Racing for 30 minutes, the eventual spoils were claimed by Joe Nally (www.Hardie-Bikes.com), continuing what has been an extremely successful season for the young racer. 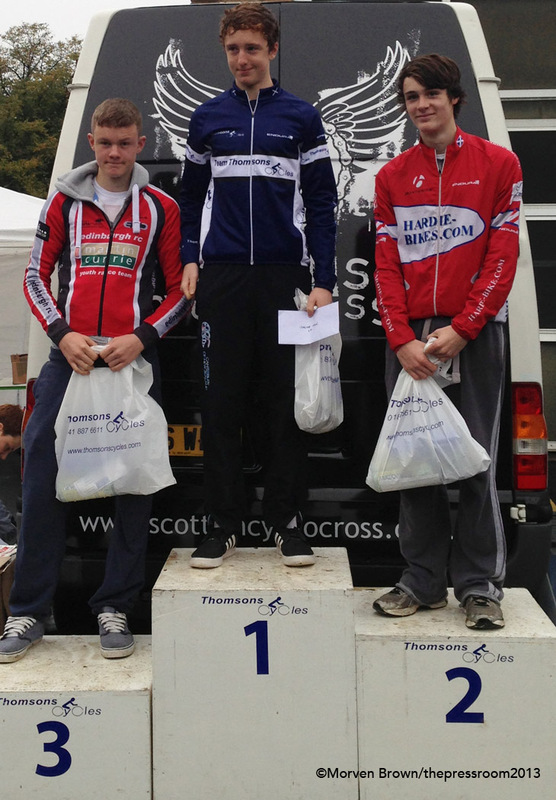 John MacLeod and Calum Shackley completed the Under 16 podium. Rhona Callander (Stirling BC) comfortably matched the boys to come in first in the Under 16 Girls, with teammate Jenny Holl in second and Eleanor Strathdee in third. Sean Flynn and Struan Pryde showed that the younger riders in this category should never be underestimated, splitting the top U16 racers to take first and second respectively. 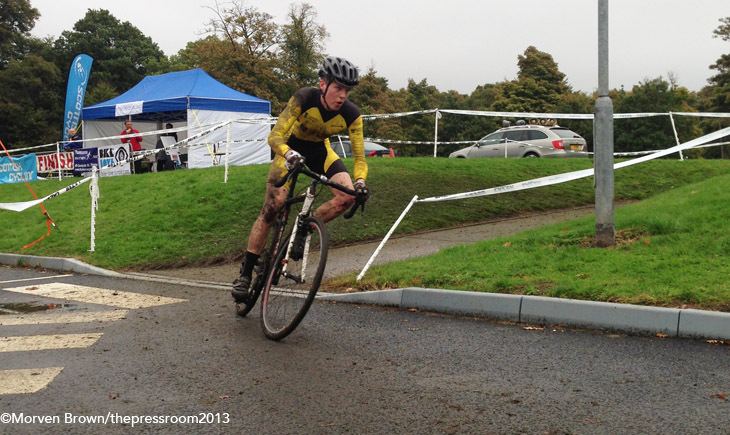 Third place went to Cameron Mason (West Lothian Clarion CC). 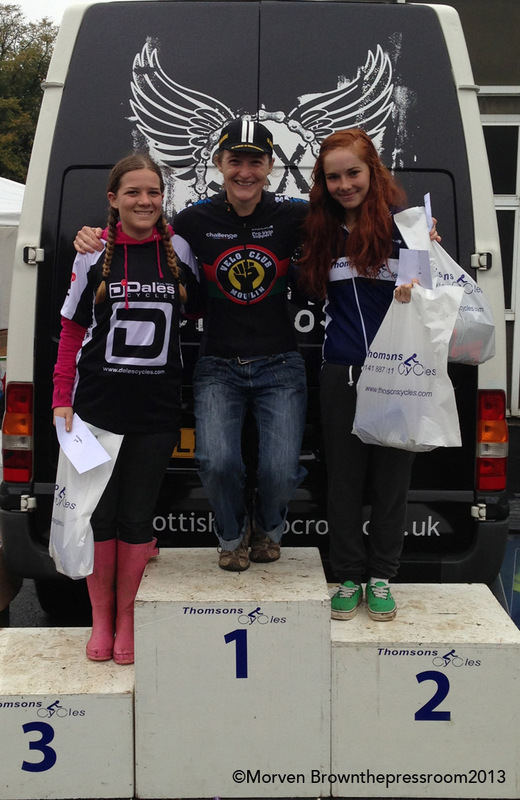 Anna McGorum (Peebles CC), Ishbel Strathdee and Anna Shackley put in excellent performances for the Under 14 Girls podium. “I didn’t have the best of starts and jenny got ahead of me for three quarters of the race. We both had a fall each which doesn’t help! I had to work really hard to spend the whole time chasing as Jenny was really strong and stayed away. Luckily for me, towards the end I managed to get towed up by Innes and made the catch. I’m looking forward to doing most of the Scottish Cyclocross season, and my biggest target for this winter season is definitely the British Cyclocross Championships. Once racing gets underway at ‘cross events, time flies and it can be difficult to catch a breath between events and in no time at all the gun sounded to signal the start of the Thomsons Cycles Junior, Women and, newly-formed, Veteran 50+ category. Eager to match the performance of his younger brother, Junior rider Harry Johnstone led the race from the off, with the chasing duo of Conor Nally and Ben Forsyth keeping him honest. Less than eight weeks after suffering a nasty fracture to his arm, Johnstone gritted his teeth against the pain and pushed on, making the most of his strong bike handling skills. Eventually Johnstone, riding for the race sponsor Thomsons Cycles, made the break riding clear of the rest of the field. Nally (www.Hardie-Bikes.com) and Forsyth (Edinburgh RC) were split by a mere 7 seconds at the finish to round off the Junior podium. Brendan Roe showed that cyclists, like fine wine (or in this case a fine cask-conditioned single malt – Ed), improve with age and comfortably matched the young cyclists more than 30 years his junior. Only allowing young Johnstone barely more than a minute, Roe finished second across the line to seal the first victory in the Veteran 50+ category. 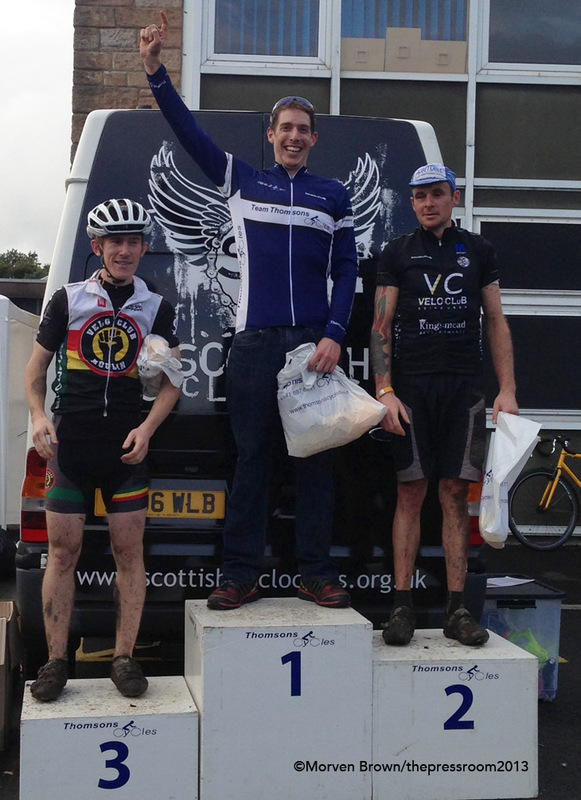 A comfortable second place went to William Young (Pedal Power RT) ahead of Jack Savage (Glasgow Ivy CC). “It was a really good race, it was pretty tough at the start with competition from Ben Forsyth and Conor Nally. After a little while it broke up as I pushed on harder, then the elastic snapped and I got away and I managed to hold onto the lead. The new Ridley from Thomsons Cycles is awesome! It was perfectly suited to the course. The disc brakes really helped, especially on the more technical descents. It’s a very stiff frame and extremely lightweight for the carrying sections, which is especially important on a course like Auchentoshan. In the Women’s category, Maddy Robinson (Velo Club Moulin) continued her dominance of the Scottish cyclocross scene, with a stunning victory of more than two minutes ahead of first Junior Isla Short (Thomsons Cycles). Both riders stayed ahead of the chasing field, despite suffering gear issues on the first and last laps, respectively. Robinson took sixth overall in the field, giving the male competitors something to think about for the rest of the Series! Third woman, and second senior went to Morven Brown (Dales Cycles) with Lyndsey Carson (Thomsons Cycles) taking the third place senior position. Special mention must go to Mona Petrie (Deeside Thistle), who won the best crash and most dogged determination of the day. After somersaulting into the undergrowth on lap one whilst tangling with a Veteran rider, Petrie had to chase down the whole field, battling up to fourth place. Brenda Callander matched her daughter’s earlier performance to take a fine win in the Veteran category. Callander suffered a puncture on the second to last lap but remained calm, staying clear of the Walkers Cycles duo of Catherine Logan and Lorna Sloan. The Thomsons Cycles Veteran Male (40-49) category is always one of the most hotly contested events with ten or so riders who could all take the top step of the podium on their given day. Sixty-nine riders lined up for 40 minutes of intense racing, and in the end only seven seconds separated first and second places. 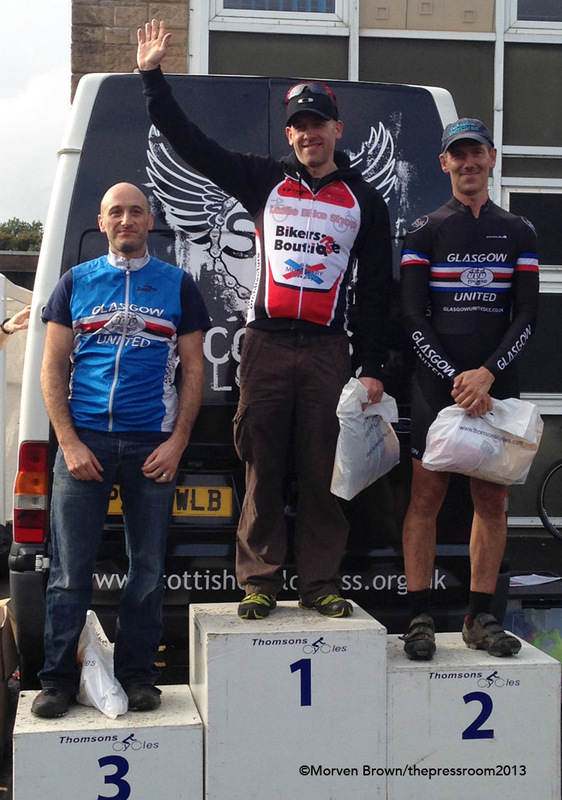 Team Leslie Bikeshop dominance was shattered with Glasgow United riders delightedly making the most of home advantage. Gary McCrae (Leslie Bikeshop) strongly completed seven laps of the energy-sapping Auchentoshan course to claim a narrow victory from James Melville (Glasgow United). Third place also went to Glasgow United with Stephen Jackson a mere 43 seconds down on the leader. Finally, the Thomsons Cycles Senior men were ready to race, with a lot to live up to following the excellent performances and exciting racing in the earlier events. With only ten riders ultimately DNF’ing, the 54 finishers put on a fantastic show of racing to delight the many spectators lining the course. With many the so-called ‘big names’ of the Scottish cyclocross scene otherwise preoccupied, there was a fantastic opportunity for up and coming riders to put their stamp on the race. An absolutely stunning solo victory saw Roger Campbell-Crawford (Thomsons Cycles) lead all the way to the finish, with strength unmatched by all the other vying contenders. By the quarter-way point, Campbell-Crawford had built up a seemingly unassailable lead of almost a minute; however the chasing pack worked successfully together to narrow the margin and with only four laps to go the advantage had been reduced to a slight 5 seconds. Ten laps and over an hour after the start gun, Campbell Crawford held on to seal an impressive and dominant victory, with Colin May of Velo Club Edinburgh less than 10 seconds behind in second place. Steven Halsall (Velo Club Moulin) rode strongly to round off the podium, ahead of a field comprising an interesting mix of youth and experience. 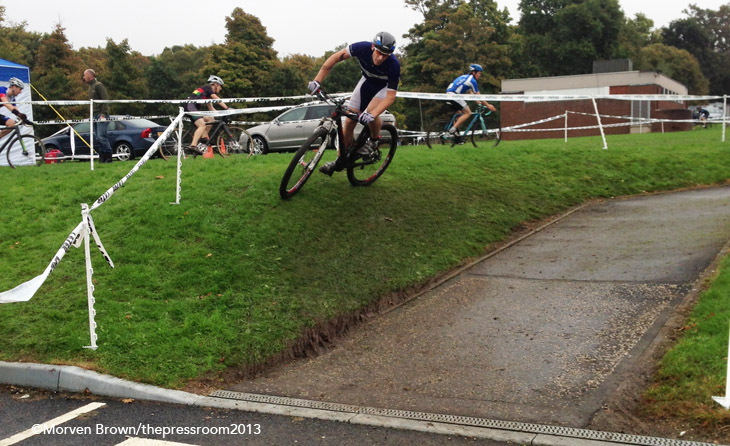 All cyclocross purists should stop reading NOW!... Campbell-Crawford was riding his mountain bike, despite having a brand new, shiny cyclocross bike sat waiting in the pits, and May’s result is all the more impressive considering that he raced on a single-speed! On every level, the opening round of the Series was a fantastic success, and special mention and thanks must go to Glasgow United CC for organising such an excellent event, along with all the other invaluable helpers who gave up their time to make the racing possible. A fortnight's rest follows, giving riders time to clean the mud off their bikes and get some emergency training done before the second round of the series at Callendar Park in Falkirk on the 20th October. If the racing there is even only half as good as it was at Auchentoshan, spectators and competitors alike are in for a treat!